We are a busy family, and when I say busy, I truly mean I have no clue but by the grace of God that we get all we do done and in a somewhat sufficient manner. And that is just the 'have-to' get done items like homeschool, three Kids Clubs, feeding the family, keeping the fire/s going, and the house relatively picked-up. There are certain things that unfortunately get put on the back burner until time becomes available to do the task, like really cleaning the house and writing on the blog. When I add any extras, for example making dolls and skincare for the Christmas bazaars, other things get pinched and minimized even more. I have wanted to do an advent study during the month of December since Tucker was a baby, and though we would start out opening the windows of whatever calendar I came upon that year, by the 8th or so day, life continued and the advent didn't. How silly is that!?! One of the most important times of the year, the celebration of the arrival of my Savior Jesus Christ, becomes overshadowed by the busyness of the day and the additional doings and events that happen during the Christmas time. Each year Christmas Day arrives and I kick myself for letting another year pass and the focus of Christmas is lost. Now don't get me wrong, my boys understand the meaning of Christmas, but what I have wanted to do and failed is to have our family steeped and infused with a sense of Christ and His season so that there is no mistaking exactly Who we are celebrating. So, in anticipation of the Advent, I've been praying and researching and have decided a few things that will hopefully direct our December down the path of true celebration. 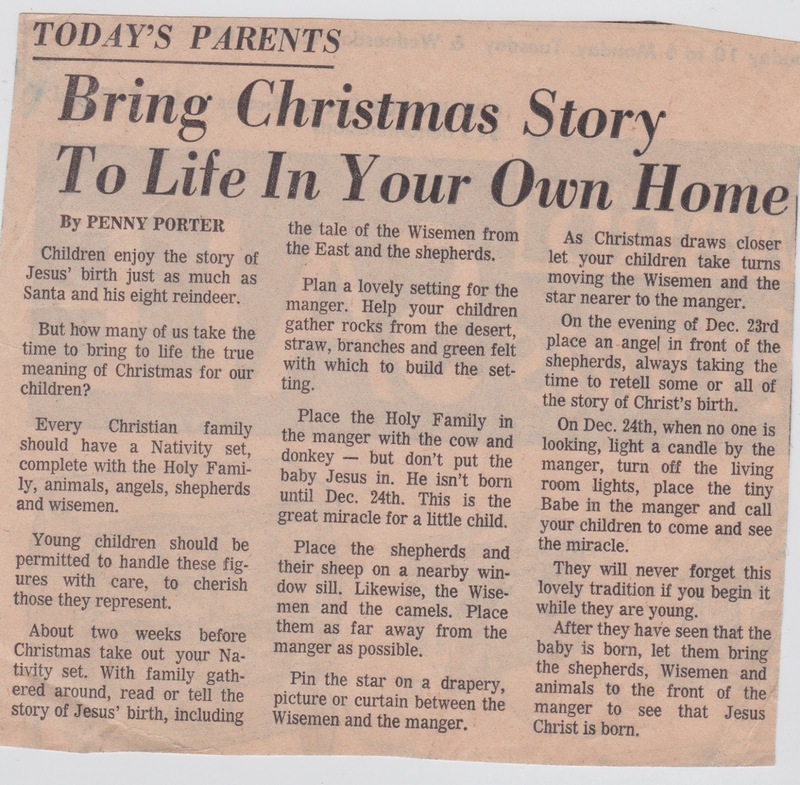 During the month of December our homeschool is going to be completely focused on the Christmas story. We are going to be journeying through the advent with the Jesse Tree. Not only are the kiddos going to be learning about the importance of the Christmas Season, but I'm planning on my personal studying being centered on just who the Messiah truly is. I hope that you will join us and am providing some of the links I will be gathering from so you can take this final week of November to prepare as I will be doing. This summer when I was outside (i.e. 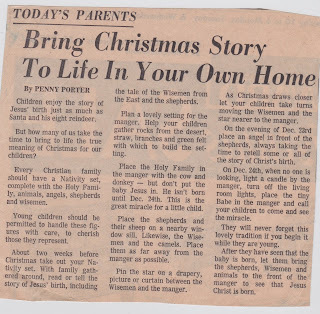 in the Lower 48), my sweet Grandma Bonnie gave me the following newspaper article from forever ago. I have no clue where she got it, but we purchased our first Nativity set so that we can do this as well. I've purchased a couple of things to read during our journey. You wouldn't have to, it was just what I wanted to do. Harrington Harmonies - This lovely mom has put together a day by day activities to do for school. This is a lot of preparing, but worth it! I'll be taking a lot from here, though some of the activities that are Catholic traditions we will be skipping. 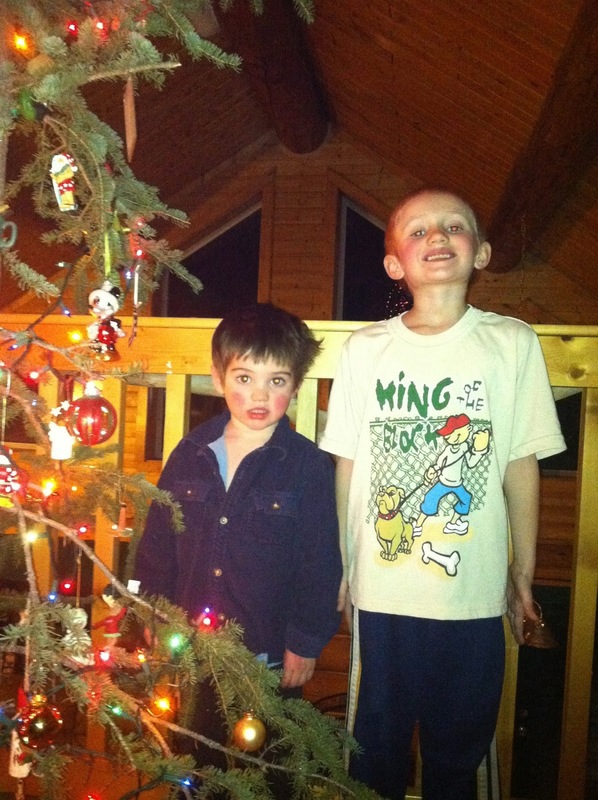 Confessions of a Homeschooler - I love this website! Erica has such amazing printables. A lot of our ornaments will be taken from her free printable. Holy Heroes - I'm not entirely sure what this series is going to be or how we will use it, but my kids love watching other kids, so I'm hoping that the daily emails will be fun to include in our study. A Holy Experience - This is for me. This is a study geared toward adults and older kids. I'm going to be doing my daily devotions from this resource and probably using the printable ornaments for my own personal advent calendar. The pictures used for each day are absolutely stunning! So, for now, this is where I am. My goal is to post about each day as we do it, but please understand if I end up having to combine some days. I hope you will want to join us. If you want to join us and would like prayer during your journey with us, please leave a comment and I will add you and your family to my prayer list! I love you all and God Bless!! !